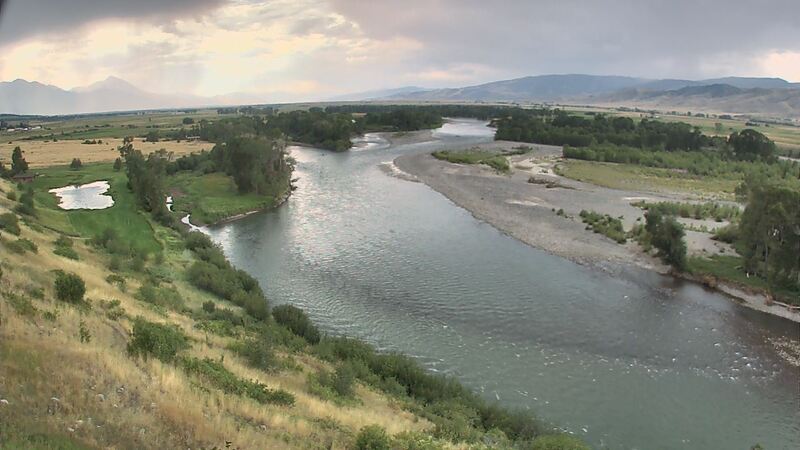 Taking a look at the Yellowstone down by Springdale, on outward appearance the river looks pretty sweet doesn't it? As we've all heard before, looks can be deceiving... In actuality, the river pretty much from top to bottom right now has anywhere from about 2 feet of viz to less than a foot depending on where you are. This water east of Livingston has some of the better viz at that 2-foot mark, but all the water has that "earthy olive" tint from the Lamar. There's no getting around the fact that a week ago it was pushing middle 60s for air temps. A goodly amount of the low elevation snow that had been hanging around is now gone. And maybe some of the mid-elevation to boot. Until we get back into a freeze-thaw cycle where nighttime temps lock things down again, our "earthy-olive" tint to the river could stick with us for a bit. Weather this weekend is saying snow again in the mountains so that should help. As for the fishing----- a lot of folks may have been disappointed. Sure, it has been pretty mild and "comfortable" out there, why isn't the river fishing lights out? Think about it a bit-- it's still March. And though the air temps may mean you don't have to be wearing 600-fill down hoody's, that water temp is downright cold, man! And with snowmelt coming in, it's not exactly going in the right direction.... Off color water in late March spells colder water temps, not warmer. Yeah, the fish are in a bit of a "pull back". If you're gonna go: All ramps in the valley and down east (mostly) are open and usable. There's still some shelf ice along the river by Big Timber whereas in the PV region, it's pretty well gone. Loch Leven that had the worst of the "Glacial Deposits" from winter ice jams is totally open now. Whatcha gonna throw? Streamer dudes are thinking pulling big gaudy, nasties will get them bent with a large brown. Could be. May not want to pull too hard though. Fishy not so Chasy.... Think low and S-l-o-w... And then slow down some more. Bobbers? well, yeah, some... Typical fare with Rubberlegs and a BH dropper. Winter locations rule- deep and slow off speed water is key. Nothing doing, yet, for spring Baetis that we've been privy to.. Soon though, soon.